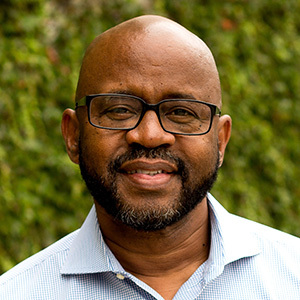 Barron, who served as a senior and administrative pastor prior to his role at APU, has a passion for racial reconciliation. He leads a ministry to increase communication and understanding among people of all racial, cultural, and socioeconomic backgrounds. He also oversees programs on campus that embrace ethnic diversity through investing in the development of student leaders. Bentz teaches courses in American literature and writing, and is the author of five novels and four nonfiction books. His most recent books include the 20th anniversary re-release of Dreams of Caladria (Enclave, 2015), Pieces of Heaven: Recognizing the Presence of God (Beacon Hill Press, 2012), and God in Pursuit: The Tipping Points from Doubt to Faith (Beacon Hill Press, 2010). His novel A Son Comes Home (Randall House, 2007) won the Silver Angel Award, was selected for Guideposts Book Club, and was chosen as one of the Top Ten Christian Novels of the Year by Booklist magazine. His newest book, Nothing is Wasted, will publish this year. Bentz’s scholarly interests include American novelists Thomas Wolfe and Harper Lee. Prior to joining APU, Black enjoyed a successful business career as a partner in an international Wall Street investment firm. As a result, he brings a unique blend of economic analysis and real-world corporate leadership experience to his field of theological study. Selected to extend the work of his mentor, the late Dallas Willard, Black is the author of several books, including The Divine Conspiracy Continues (Harper-Collins, 2014), coauthored with Willard. A renowned youth and family expert, an acclaimed author, and the founder of HomeWord, a radio program that reaches more than 1 million people across the country each day, Burns has a passion for healthy marriages and families. In partnership with APU, he established and provides leadership for the HomeWord Center for Youth and Family, a research and training institute offering biblically based resources for parents and youth. The center is the largest provider of Christian parenting and youth seminars in the United States. Cairns is a former senior vice president of human resources for NBC Universal and presidential appointee to Homeland Security under presidents George W. Bush and Barack Obama. He is known as a specialist in talent management, mergers and acquisitions, project management, leadership development, executive coaching, and strategic planning. Clay, a 2002 graduate of APU, is a two-time Olympic medalist in the decathlon, capturing the silver in 2004 and the gold in 2008. Through the Bryan Clay Foundation and as a motivational speaker, he equips and encourages Fortune 500 companies, professionals, entrepreneurs, donors, families, and aspiring young people on the journey to success in work and life. Duke spent four years studying in the Middle East, which has highly influenced his perspectives and teaching. Duke received a Rotary Ambassadorial Scholarship to study at Hebrew University in 2000–01, and was a fellow at the Albright Institute for Archaeological Research in 2005. Today, Duke serves as the western region director and Distinguished Scholar of Hebrew Texts for the Green Scholars Initiative. He is also a foster care parent and advocate. Henck has served in faculty and leadership roles in higher education for more than 30 years. Her areas of specialty are transformational leadership, effective leadership teams, leadership transitions, organizational culture and change, and generational differences in the workplace. Girguis served as a supervising psychologist in the outpatient trauma treatment program at Children’s Hospital Los Angeles. His clinical work focuses on the treatment of traumatized children and adolescents, including children in foster care and children experiencing homelessness. He is certified in trauma-focused cognitive behavioral therapy. With interests in group facilitation, teamwork, the development of collaborative communicative practices and organizational structures, leadership education and training, and qualitative research methods, Hartwig’s work aims to help nonprofits and churches leverage effective group and organizational communication practices, processes, and structures to fulfill their missions. He is the author of Teams That Thrive (InterVarsity Press, 2015). Johnson is the founding dean of the College of the Arts. As a composer, his repertory includes various solo, chamber ensemble, large ensemble, and choral/ orchestral performing forces that have been performed in recitals, concert halls, and music festivals. Alexander Jun, Ph.D., is a TEDx speaker and the author of From Here to University: Access, Mobility, and Resilience Among Urban Latino Youth (Routledge Press, 2001). He has published extensively on issues of postsecondary access for historically underrepresented students in underserved areas. Jun recently completed a three-year research project on the educational mobility and academic resilience of Khmer orphans. As an APU chaplain, Mannoia oversees the spiritual care ministry for graduate and professional programs as well as for faculty and staff. Prior positions include dean of the School of Theology and president of the National Association of Evangelicals. Ordained in the Free Methodist Church, he has many years of pastoral and leadership experience in the denomination. He is the author of numerous books. Mullins comes to APU after spending a number of years in Israel. His interests include the fields of archaeology, history, geography, and biblical studies in an effort to better understand the world of the Ancient Near East. Mullins serves as lead archaeologist at APU’s Abel Beth Maacah excavation site in Israel, one of the last remaining sites of biblical significance to be excavated. A former nun turned screenwriter, producer, script consultant, and founder of a Christian screen writers’ program, Act One, Harrington believes in the art of visual storytelling as a means to impact culture. She frequently shares her opinions on Hollywood and its films in articles and blogs, viewing them through a lens of faith. Parham teaches cinematic arts classes, including Introduction to Film, Screenwriting, and Television Writing. He is a member of the Writers Guild of America and has written for the long-running CBS’ drama JAG and the Family Channel sitcom Big Brother Jake, and he served as a writers’ assistant for the third season of Touched by an Angel. Parham contributed chapters to the American Chemical Society’s anthology Hollywood Chemistry: When Science Met Entertainment; Doing Good, Departing from Evil: Research Findings in the Twenty-First Century; The Gospel According to Superheroes: Religion and Popular Culture; and Behind the Screen: Hollywood Insiders on Faith, Film, and Culture. Strother has extensive experience in business and teaching in the United States and abroad. He spends a significant amount of time in China and other parts of Asia each year leading study abroad programs. He is the author of Living Abroad in China (Avalon Travel Publisher, 2006). Slater is a retired National Football League offensive tackle who played his entire 20-year career with the Rams organization, playing 19 seasons for the Rams in Los Angeles (1976–94) and 1 season for the Rams in St. Louis in 1995. Slater appeared in seven Pro Bowls and broke a record for most seasons with one team. His jersey number was retired and he was inducted to the Pro Football Hall of Fame in 2001. Thornton strives to develop future accounting professionals with competence and character. His research interests focus on ethics and the accounting profession, auditor independence, auditor litigation, and whistleblowing. Thornton is a nationally recognized author and speaker and serves on several editorial boards for accounting ethics, forensics, public interest, and accounting education journals. Walsh focuses on American government and U.S. political institutions, including congress, the presidency, the federal judiciary, constitutional law, and state and local politics. She is a leading national expert on the Three Strikes Law. Waters is an ordained minister in the Missionary Baptist Church, and he also served as a pastor in the Methodist Church for 28 years. His expertise involves the New Testament and early Christian literature, the book of Revelation, and other apocalyptic literature. Wong became a certified orthopedic specialist in 2004 and a fellow of the American Academy of Orthopedic Manual Physical Therapists in 2005. Along with teaching at APU, he practices at the Loma Linda University Medical Center Orthopedic Outpatient Clinic. He is the creator of an innovative physical therapy app that helps students and physical therapists diagnose patients and recommend treatment options.